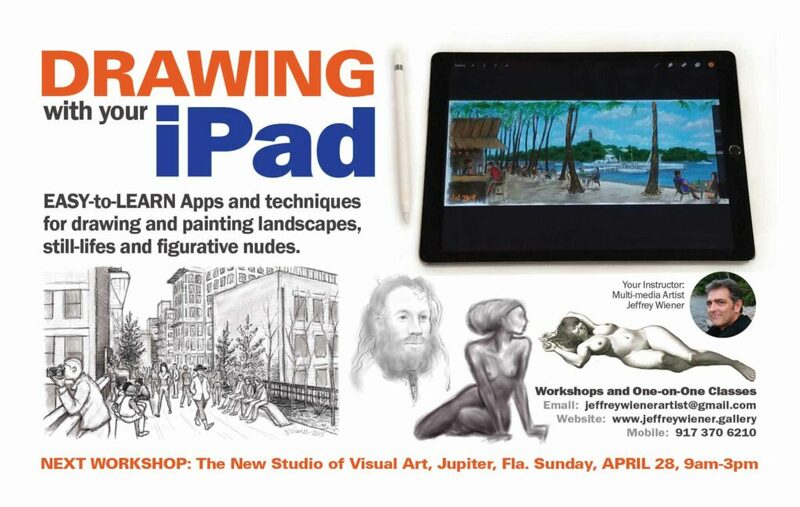 Join me at The New Studio of Visual Arts in Jupiter, Florida this April 28th, 2019 for a four hour/ two-part workshop: “Lifedrawing with the iPad”. First, I’ll give a presentation of the creative possibilities with the iPad by showing the drawings, paintings and animations created using this amazing drawing tool. Then we’ll cover the basics for using the APP “Procreate”, the most popular APP for drawing and painting on the Apple iPad. After a light lunch at noon, we’ll dive into how to use these mobile art-making devices to capture still-lifes, gestural poses and detailed figurative nudes, colorful landscapes captured “en plein air” and even narrative animations exported as videos. We’ll also cover how to print out your digital artworks, and share them to social media directly from the Procreate APP. Requirements: Students must have the APP “Procreate” installed on their iPads prior to class. 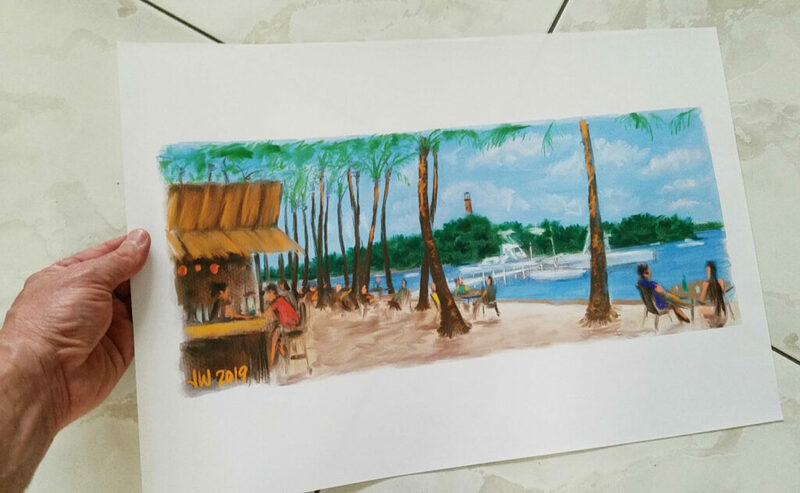 A archival-quality color print of the finished painting (Lighthouse, as seen from the Square Grouper Tiki Bar in Jupiter, Florida). Printer: Canon Pixma Pro-100. A 2 hour color sketch (exported as a two minute animation) created with the APP ‘Procreate” on the iPad. I would like to take an ipad workshop to learn to use the app Procreate. I have another workshop scheduled in Jupiter, Florida on April 28th. I will also be holding workshops in New York state this summer. I will put you on my email list to keep yup updated, if that’s OK.